CK One Gold will perfectly emphasize your personality and taste. 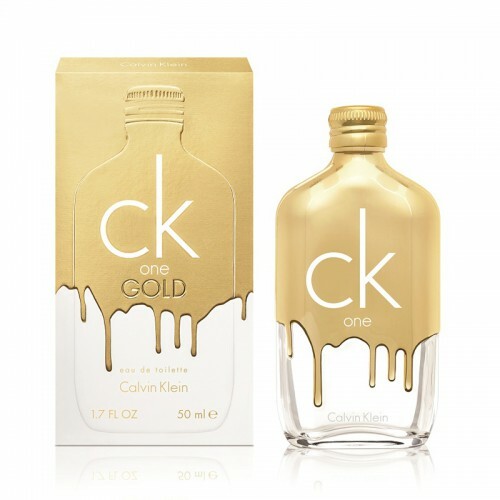 CK One Gold 100ml. EDT - Soft wood unisex from Calvin Klein for daring and strong-willed, original, ambitious and self-confident. A completely new fragrance that offers everyone to forget about the hectic gray everyday life and breathe in a breath of freshness and freedom! With the first breath of Calvin Klein CK One Gold, you fall in love with this perfume, it will perfectly emphasize your personality and taste. The main chords Calvin Klein CK One Gold is represented by woody-spicy shades, where the magnificence of perfume opens with rich citrus and fruit notes. The unusual refreshing bergamot dissolves in a mesmerizing ensemble of figs and spicy tart of sage, interwoven with delicate jasmine flowers and the luxury of velvet violets. A fragrant cocktail envelops the dry tartness of the vetiver and the eastern spice of patchouli, which gradually subside, leaving an unforgettable mark. CK One Gold is a seasonal youthful fragrance with a juicy and fresh wood character, combining the strengths of both sexes. The energetic fresh notes at the start represent an unexpected combination of figs, bergamot and sage. The bright heart of neroli is shaded with notes of jasmine and violets. Solar vetiver gives the fragrance depth and, in combination with patchouli and guaiac, leaves a sensual and warm trace on the skin.